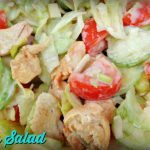 Tasty, skinny chicken salad, perfect for summer days! It’s fresh, healthy, low-calorie, light and delicious! 1 pack thousand island seasoning not sauce! Mix the kefir with the seasoning. Cut the iceberg in halves, cut out the stem and slice the leaves. Cut the tomatoes into eighths. Mix the veggies, the cheese and the sauce. Put it into the fridge. Dice the chicken breast and stir fry them with a little salt and pepper. Let the chicken cool a little and mix the dices with the rest of the salad. Put back to the fridge for 15 mins.